Today in Masonic History William Cushing is born in 1732. William Cushing was an American jurist. Cushing was born on March 1st, 1732 in Sicituate, Massachusetts. In his youth his grandfather and a teacher at a local Latin school were his educators. He graduated from Harvard College in 1751. After that he became a member of the bar in Boston. Cushing briefly practiced law in his home town of Sicituate before moving to the Massachusetts province's eastern district, which is now Maine. There he became the first practicing attorney in the eastern district. 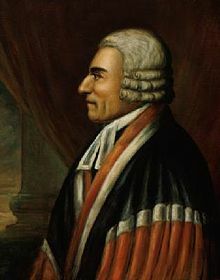 In 1762 he was called to become a barrister, again the first in the district. He continued to practice law in the eastern district until his father retired from Superior Court bench and the Governor appointed Cushing as his replacement. Shortly after Cushing took over the position on the Superior Court, it was revealed that Judges on the court were to be paid by London and in crowns, instead of by order of the local legislature. Cushing refused the money from England in preference to a local appropriation. After the beginning of the Revolutionary War, the Massachusetts Provincial Congress dissolved the Superior Court and reformed it. Cushing was the only judge that was kept from the previous court. The case relied on an earlier verdict handed down in 1781 when Elizabeth Freeman, also known as Mum Bett, became the first black slave to sue in Massachusetts and win her freedom. The case of Commonwealth v. Jennison led to slavery being abolished in Massachusetts. When George Washington became the first President of the United States, Cushing was one of his first appointments to the United States Supreme Court. He would be Washington's longest serving appoint and swore Washington in at his second inauguration. Washington would attempt to promote Cushing to Chief Justice from Associate Justice. Cushing refused the promotion. Cushing passed away on September 13th, 1810 in Sicituate. Cushing was a member of St. Andrew's Lodge in Boston, Massachusetts.